While shelving books one day recently in our children’s section at Flintridge Bookstore & Coffeehouse, I heard a small voice behind me say, “Ummm…Hi! I was wondering…do you have more books like these?” A small boy beside me, about the height of my elbow, pointed at our row of The Last Dragon Chronicles by Chris D’Lacey. “What did you like about them?” I asked encouragingly. “Well, I just like the dragons a lot. I just do,” he replied. He sort of defensively rushed his words at me, as though I was about to disagree with him. The little boy could not have known this beforehand, but I myself do like a good dragon-filled book. I made sure to tell him that I am totally “pro dragon.” We had a grand time picking out some more dragon themed books for him to read. Just about a week later, a young girl told me that she was looking for a new book. “I have read a lot of dragon books. A lot of them,” she announced proudly. These young dragon aficionados have made me realize just how many books I have read with dragons as characters. There really are a lot of fantastic dragon themed books! So, I’ve made a list of my favorites and included some more recently published titles. 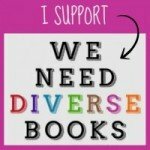 The books I have chosen to list here are personal favorites, but please feel free to add to the list, comment upon it, or mentally high five me! I think this “dragon mania” is going to be a lot of fun! Here is the classic story by Munsch that I grew up with myself. Elizabeth is a princess who is set to marry Prince Ronald, all ready for her own happily-ever-after. However, the wedding doesn’t go as planned as the momentum of an unexpected chain of events moves the story disastrously downhill! Elizabeth’s castle is smashed, her dress is “toasted” by fiery dragon breath, and her Prince is gone. All this chaos is thanks to a recent visit by a fire-breathing dragon. With true gumption, Elizabeth defies fashion by putting on a paper bag and venturing forth to rescue her prince from the clutches of the dragon! When she finds the dragon, she outwits him by engaging him in showing off his fine array of dragon stunts. The dragon complies and becomes completely worn out. Ready for the twist? After all that hard work, Prince Ronald doesn’t want her after all. “Come back when you are dressed like a real princess,” he tells her. Well, too bad for him – he missed out on one amazing girl! I first read this book as a little girl at my best friend Laurie’s house. When I finished reading it, I asked Laurie, “Why do you like this book? They don’t live happily ever after!” My friend (she’s a lawyer now) was always very pragmatic, even as a young girl. “She’s a princess. He’s a bad guy.” she replied with sort of a shrug. I had to agree that was true and together we concurred that we wished Elizabeth good luck with her next love. We just knew there had to be a special prince out there awaiting such a well deserving princess! It’s every knight’s job to slay the dragon when the dragon is found. We all know this to be true. Yet, what if a knight found three wide-eyed little dragons instead? What happens then? As the story begins, the Good Knight hears a loud roar and boldly ventures forth to save the day. However, instead of finding a dragon to fight he finds three little dragons that can’t sleep. It is at this point in the story that we enter into the all too familiar “getting ready for bed” scenarios that we all know so well! The Good Knight has to deal with a litany of little dragon demands – stories, songs, and glasses of water! Young readers and parents alike are certain to find much to identify with here. Of course, we also have the privilege of meeting one very good knight who can tuck a young dragon into bed just right. Good Night, Good Knight is a wonderful read aloud for just before bedtime. This is also available as an excellent Level 2 reader. Princess Cimorene is not your usual fairy tale princess. She wants to learn Latin, fencing, and how to cook. Are these qualities that her parents approve of? Certainly not! They are desirous of a daughter who follows pursuits they would deem to be more feminine. Her parents begin to plan her marriage to a prince who is just not quite as intelligent as Cimorene. In fact, he’s pretty much not the brightest bulb in the chandelier, if you catch my drift. Being whip-crack smart herself, Princess Cimorene takes the good advice of a nearby frog and decides to become the dragon Kazul’s princess. The princess refuses all efforts to rescue her from this life as a dragon’s “girl Friday.” I especially envied Princess Cimorene’s new responsibilities of organizing dragon treasure hoards, and categorizing their scrolls. Imagine what you could learn! Wrede’s humorous, well crafted book had me in smiles and giggles the entire time I was reading it. Ben is a lonely orphan who happens to meet Firedrake who is a silver dragon needing help to escape to his ancestral home known as “The Rim of Heaven”. This is where dragons can live in freedom, safely away from humans. In this story Ben, Firedrake, a brownie named Sorrel embark on a journey to go to “The Rim of Heaven” so that Firedrake may live a better life. However, a powerful and evil villain named Nettlebrand, the “Golden One” is on their trail. Many countries are crossed as these three heroes meet magical beings and make extraordinary friends as they race to the Rim of Heaven. The question is, can they get there in time before their mysterious foe catches up with them? Ms. Funke, the author of the famous Inkheart trilogy, does not disappoint her younger readers! She provides an amazing world, and an exciting race to a finish line that will keep readers enthralled until the very end. The author herself provides the most wonderful illustrations for the book. As an aside, in an act of sheer geekery, I bought the book for my own children’s literature collection (in its first printing) because there was a pop-up map in the middle of the book! I’m just such a sucker for a good map and it came in very handy as it showed the journey of our heroes from the very beginning to the very end of their exciting but occasionally perilous journey. Creel’s aunt and uncle have fallen upon hard times. In a moment of what Creel’s aunt deems sheer brilliance, she decides to provoke a local dragon into taking Creel hostage. Now, of course a noble and wealthy young lord will come to do battle with the dragon to rescue the fair maiden. According to her aunt he will then marry Creel, and all the family’s economic problems will be solved. The trouble is that the local dragon, Theoradus, is not interested in the slightest in taking Creel prisoner. In fact, he is much more interested in his hobby of shoe collecting. Creel herself is much more interested in escaping rather than being rescued. She wishes to journey to the city known as the King’s Seat to attain her dream of becoming well known as an embroiderer and having her own embroidery shop. This was a skill with powerful implications that had been taught to her by her late mother. What ensues is a pact between dragon and maiden. Creel is really in need of some new shoes to begin her journey. Theoradus will give her any pair of shoes she wants if she will ensure that the young lord will never come to bother the dragon. The sheer range of shoes that Creel gets to choose from is incredible. The collection has shoes with emeralds on them, children’s shoes, sensible shoes, and one very fine pair of blue slippers that fit Creel perfectly. Yet, there is some mysterious power about these shoes. Creel and her new slippers must make their way in the world as she journeys towards the big city. Yet, can she discover the true magic behind the dragon’s slippers? The author, Ms. George, combines a winsome heroine, and even more winsome dragons in her tale of fine needlework, dreams worth attaining, dragons, and a bit of romance to keep things interesting. Do you dream of reading about dragons that collect shoes, stain glass windows, and one fussy dragon that caringly and fanatically adopts dogs? Look no further! Middle grade readers who are fans of Gail Carson Levine’s books such as Ella Enchanted will find a real treasure of a book when they read about Creel and her adventures. Creel’s adventures continue in the two sequels to this book. Our heroine, Jennifer Strange, is a foundling attempting to run an employment agency inherited from her mentor, The Great Zambini. This employment agency functions to find job placement for an occasionally unemployed group of wizards. The trouble is The Great Zambini has disappeared leaving Jennifer to run the company of Kazam on her own. In an alternate world where Jennifer lives in the “UnUnited Kingdom”, British author, Jasper Fforde, populates his first young adult novel with quirky wizards, a Quarkbeast (don’t worry, he’s a tame pet with razor sharp teeth who is Jennifer’s loyal companion), and a dragon of course! This is a world where the affects of the lack of magic have reached the level of a true energy crisis. For example, one of the wizards, once a great sorcerer, now must use his magical abilities to pilot his flying carpet as a pizza delivery service. Low on magic, this is tragically all the energy he has left. A prediction of the last dragonslayer killing the world’s last dragon has everyone at Kazam wondering if perhaps the death of this dragon could mean the end of magic altogether. Fifteen-year-old Jennifer embarks on a humorous yet adventurous quest to sort out these predictions, and to find out the truth about the last dragonslayer. She must negotiate the plans of a greedy prince, equally greedy companies, while she is also trying to train a new assistant to help with wizard unemployment! There is never a dull moment at the company of Kazam. I admire the author for his ability to create an intriguing alternate world that combines today with “some place out there.” This is a place where dragons can remember a home where they used to live under a violet sky with two moons. Meanwhile in the same story, Jennifer can find her pet Quarkbeast at her local Starbucks! This tongue-in-cheek novel is sure to please Lemony Snicket fans or anyone looking for a truly original fantasy novel for middle grade to young adult readers. A twelve-year-old with a good vocabulary would enjoy this just as much as the young adult audience it was intended for. A second book in this series, The Song of the Quarkbeast, is to be released in the United States later this year. 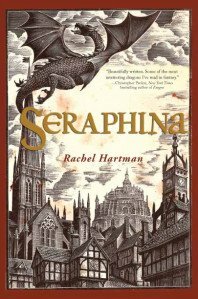 My cousin and fellow voracious reader, Grace Duryée, has penned a fantastic review of the young adult novel, Seraphina, by Rachel Hartman which also features dragon characters. Please check it out next week on the blog! I think you will be very glad you did. I wish your children loads of brilliant dragon adventures. 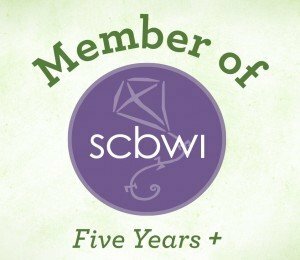 Remember to add to my list to your own hoard of dragon book recommendations! Happy reading, dragon fans! Please visit the Flintridge Bookstore & Coffeehouse today to pick up your copy of these great books, buy gifts, enjoy their extensive selection of other great reads and relax over a great cup of coffee. 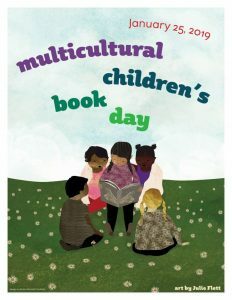 Also visit the website at www.flintridgebooks.com to keep up-to-date with story times, author events and other exciting special events. And when you stop by, keep a lookout for Hilary peeking out from behind a novel.